SMI-4a is a potent inhibitor of Pim1 with IC50 of 17 nM, modestly potent to Pim-2, does not significantly inhibit any other serine/threonine- or tyrosine-kinases. Loss of proliferation in ATL-derived cell lines by the Pim-kinase inhibitors, Smi-4a (C). Cell counts were repeated at least twice. Results represent the percentage of cells alive after 5 days of Pim inhibitor treatment, compared with 5 days treated with DMSO. For Smi-4a treatment, cells were treated with 0, 10, or 20 μM Smi-4a. Normal PBMCs (n = 2) were used as a control. Western blots indicate loss of Pim1 targets, p-4EBP1 (Thr37/46), p-p70S6K (Thr389), and loss of pBad (Ser20) (negligible for Smi-4a) after 24 hours with 0, 10, 20, or 40 μM Smi-4a or DMSO control. Blood, 2016, 127:2439-2450.. SMI-4a purchased from Selleck. 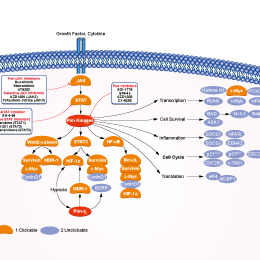 SMI-4a (5μM) synergizes with rapamycin (5 nM) to cause significant growth inhibition of leukemic cells. Beharry Z, et al. Mol Cancer Ther, 2009, 8(6), 1473-1483. Lin YW, et al. Blood, 2010, 115(4), 824-833. 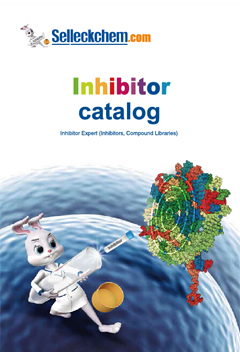 SGI-1776 free base is a novel ATP competitive inhibitor of Pim1 with IC50 of 7 nM in a cell-free assay, 50- and 10-fold selective versus Pim2 and Pim3, also potent to Flt3 and haspin. Phase 1. AZD1208 is a potent, and orally available Pim kinase inhibitor with IC50 of 0.4 nM, 5 nM, and 1.9 nM for Pim1, Pim2, and Pim3 in cell-free assays, respectively. Phase 1. Features:Stattic is the first non-peptide small molecule with inhibitory activity against STAT3 SH2 domain regardless of the STAT3 phosphorylation state in vitro.